Successor to the venerable Power Commander III, the Power Commander V is not only smaller but offers increased fuel delivery tuning options. Power Commander V allows fuel adjustment tuning based on throttle position and RPM. Custom mapping is highly recommended. The Power Commander V USB is a must have tool for fine-tuning a fuel-injected motorcycle when changing an airbox, changing exhaust, or doing additional engine performance modification. The Power Commander V is an add-on ECU, once programmed by a dyno, or with an auto-tune module, it will add or subtract fuel from whatever the stock Aprilia ECU puts out based ONLY on RPM and throttle position %. Since the Power Commander V only looks at RPM and throttle position %, the three maps are not affected, because the three maps are controlled by Aprilia's Ride By Wire system which changes the speed that the throttle bodies open as well as other parameters. To be 100% correct, the Power Commander V would need to be mapped in all three modes. The Power Commander V can only hold two maps. For these reasons, AF1 Racing recommends to first purchase The official Aprilia RACE ECU and then to use the Power Commander V for fine tuning in your favorite of the three maps. 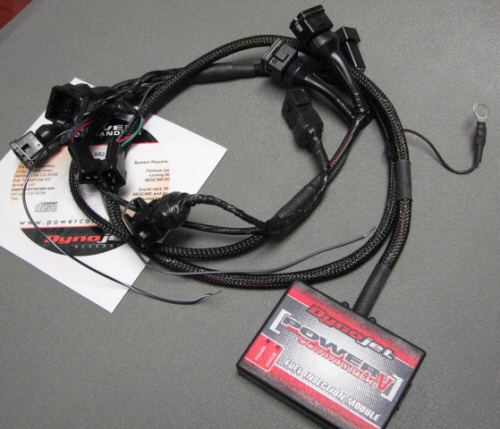 AutoTune For Power Commander V When custom mapping via a Dyno is not possible, the AutoTune wideband O2 sensor and controller connect directly to the Power Commander V to automatically adjust the fuel map while riding.